Spreading disease awareness on preventive measures for Hepatitis so millions of people can stay safe. Hepatitis B & C, which are most threatening, are caused blood and serum contacts such as pre-used injections, blood transfusion, infected blades and other skin piercing instruments etc. amongst others. This awareness is being carried out to the general public to help bring the new infection rates low. The tagline ‘Janna Zindagi Hai’ contains the crux and main emphasis of the awareness campaign: to know is to live. Social aspects of Hepatitis where the campaign caters debunking myths surrounding the disease which in turn make lives of Hepatitis patients difficult. Powerful messaging to support existing patients is adopted here. The key messages include topics like ‘It is totally safe to work with Hepatitis patients’ and ‘Hepatitis C is not spread by touching or hugging a family member who is combating the disease’. Testing and Treatment is now increasingly affordable and in case of Hepatitis C, highly effective with 95% cure rates and low side effects. 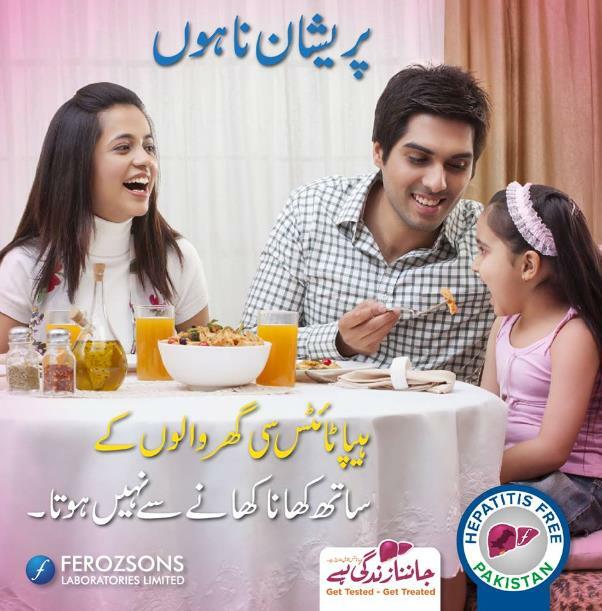 In Pakistan, an estimated 15 million people are living with Hepatitis B and C unaware. Hepatitis can stay silent in the body for many years before symptoms begin to appear, but if untreated, can lead to liver cirrhosis and cancer. With this movement which is gaining traction with every passing day, we call on people to take action, raise awareness and join in the quest to find the missing millions.